DETAILS Our children enjoy making and distributing place cards at Thanksgiving. You might show your children some of our ideas and let them choose what they'd like to do. 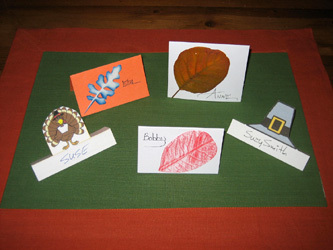 I precut the place cards so we can start right in with the creative part of the activity. Remember to double the size you want, as you'll be folding them in half so they'll stand. Ideally, use card stock. Decorate and add names. If you are gluing on an image, remember it has to fit the size of the precut card. Using computer paper placed over a real leaf, rub the paper with a crayon, reproducing the leaf image. Cut and paste on the place card. Add name. 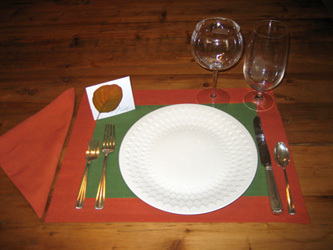 Make sun prints of leaves, cut out and paste on the place cards. Add names. Print and cut turkey and pilgrim hat pop ups. Add names.